The CyberView MRK-19-2 (MRK-19-2L - left hinged mount, MRK-19-2R - right hinged mount) is a 2U Dual-display 19" rack console drawer is designed for Command and Control Systems which demand quick deployment of side by side displays. 19" displays satisfy the increasing demand for superior graphics and image clarity. 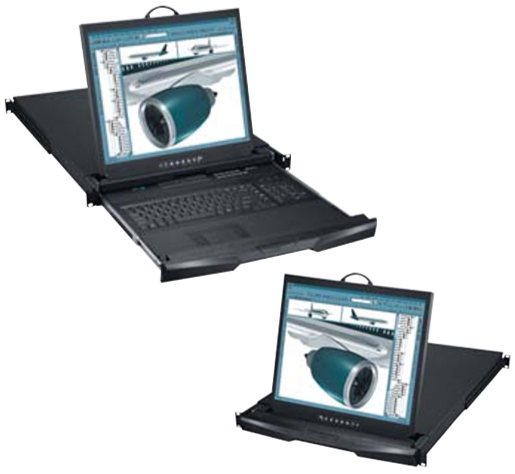 2U 22" depth platform allows for small size and transit case portability. To ensure chassis ruggedness, mobility and quality, as well as being suitable for harsh environment applications, the MRK-19-2 drawer is meticulously constructed by our team of experts in our own CNC facilities for such applications.